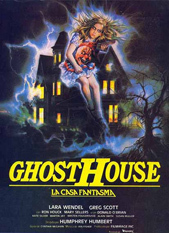 Ghosthouse was originally marketed as a TV sequel to the Evil Dead films, which were called La Casa in Italy. It contains pretty much zero similarity to anything in the Evil Dead series, save they are both set somewhere on Earth and feature humans breathing oxygen… well, at least until something supernatural kills them. In place of unrelenting horror and over the top gore, Ghosthouse offers a shocking amount of no holds barred HAM Radio operation. The director, Lenzi, known for the infamous “Cannibal Ferrox” (1981) and my personal favorite, “Nightmare City” (1980), throws everything it can into the mix but never manages to rise above its extremely silly delivery. We begin with a couple of hitchhikers who decide the best possible idea is to stay in a creepy abandoned house. They are quickly dispatched by a ghostly little girl and what looks like a slightly larger version of the evil clown from “Poltergeist” (1982). Soon after all this, we meet Paul (Greg Scott) and his girlfriend Martha (Lara Wendel). Paul is a HAM radio enthusiast, and has quite the set-up in his cavernous apartment. Late one night he gets a strange signal, which sounds like a lullaby and then a woman screaming. Through the magic of 1988 computer technology he somehow locates the precise location of the signal. Naturally it’s the spooky house from the opening, which is now being investigated by some kids in a Winnebago and by coincidence they have set up a HAM radio of their own in the attic. On top of a little girl ghost murdering people left and right, there is also a crazy groundskeeper to avoid. Can Paul, Martha, and the band of losers in the Winnebago uncover the mystery of the ghost before they get killed? The best I can say for Ghosthouse, is that it isn’t entirely terrible. There are sequences that capture that peculiar dream like atmosphere featured in many Italian horror movies. The actual moments when the ghostly girl appears are bizarre and brightly lit. Mirrors wobble and bend under her power, light bulbs inflate before exploding, and underneath the house is giant pool of bubbling yogurt. All these together could have added up to a creepy haunted house story if there weren’t so many other problems. The acting ranges from tepid (Paul) to inexplicably terrible (Everybody Else), save Donald O’Brien as Valkos the groundskeeper, who easily turns in the best performance. There is the bizarre inclusion of a fat guy who seems to be hitchhiking across the country with a backpack that is filled with practical joke skeleton arms but no food. The plot has to keep bending over backwards to get people to go back into the house after there have been a number of deaths. The police show up at one point to haul bodies away, but apparently don’t care about investigating anything inside the house and are all too happy to let people stay out on the front lawn in their Winnebago. The less said about the annoying repetitive ghost lullaby the better. If you’re looking for a few minor (very minor) chills and a few minor (extremely minor) laughs give it a look. Otherwise I’d recommend you go watch La Casa (aka Evil Dead) again. You’ll get more out of it.